You know that saying "Go big or go home"? This card is 6x6. That's BIG. I made it for my neighbour to send to a couple whose wedding she can't attend. This is my second attempt that this card - here's the first. My neighbour wanted something with a little more 'presence' shall we say. She was very pleased with this one, which was a big relief to me, because I don't know how many leftover sunflower wedding cards I'm going to need this summer! Again, I used a Stampin' Up poinsettia stamp (a bigger one from a different set this time), stamped, offset and stamped again so that the petals overlapped, then stamped a big circle in brown and filled it with Cinnamon stickles. I matted the main panel on gumball green and then on some beautiful yellow vellum. And since the only 6x6 envelopes I have are brushed gold, this card is going to land on the doorstep with a nice solid visual and audible 'thump'. Presence indeed! Oh, hahaha, I totally remember that story about your neighbor wanting something not as CAS! Way to combine her tastes with your style. It's still very "you" but definitely a lot louder! LOL! Such a cute story! I'm sure you would rather have her happy than just ok with it. 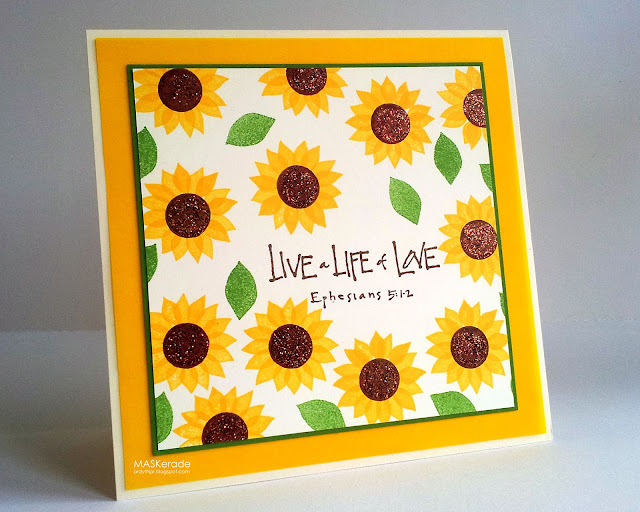 The card is beautiful with all the yellow and those creative "sunflowers" are gorgeous with the brown stickles centers and I love the green leaves. Nothing better than a bunch of sunflowers to start my day! this is beautiful and sweet at the same time. I love love love that sentiment! This is really pretty. And, at 6X6, it certainly has presence. The minute I saw this card I thought "Another sunflower?" I forgot about the need for something a little "more". She must be pleased with this one. What a nice, bright, cheery wedding card! Good way to get use out of that poinsettia in the summer. :) Like the Stickles centers as well.